Meet Corey from SANS MAP. 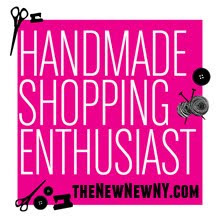 She is a self-taught Brooklyn based sewer and designer with an ever-growing penchant for vintage aesthetics, old world quality and the utilization of recycled and re-claimed materials. She sources her fabrics from many different, and sometimes unlikely, places and rarely purchases fabric newly manufactured. She explains: "There is an abundance of materials that can be found and I take advantage of these resources whole-heartedly. 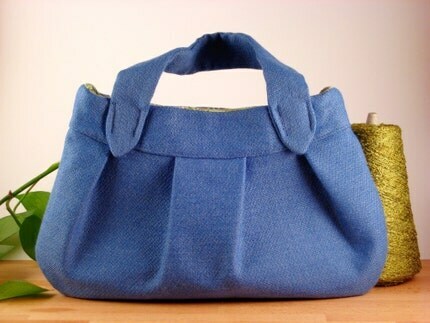 Through the process of incorporating both new and re-purposed materials, each bag contains a past and a present and within each piece, a story is created. Sans Map is the result of an evolving quest to simplify, live sustainably and travel lightly. Because no matter where you are now or where you are going in the future, it’s always a journey." 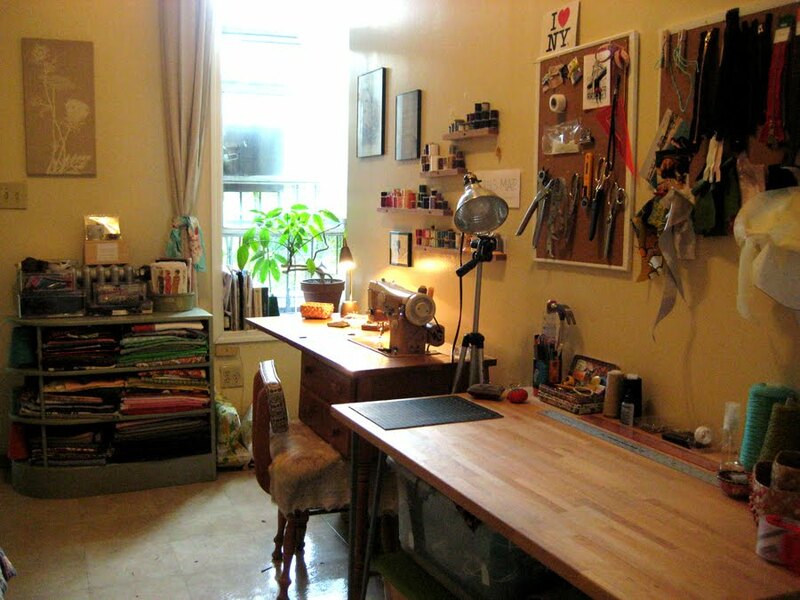 Corey invites us along on a tour of her beautiful work space in Brooklyn. Corey says: "My studio is in my home in Brooklyn; it's half sewing studio, half music production studio (that's my husband 1/2 :-) . 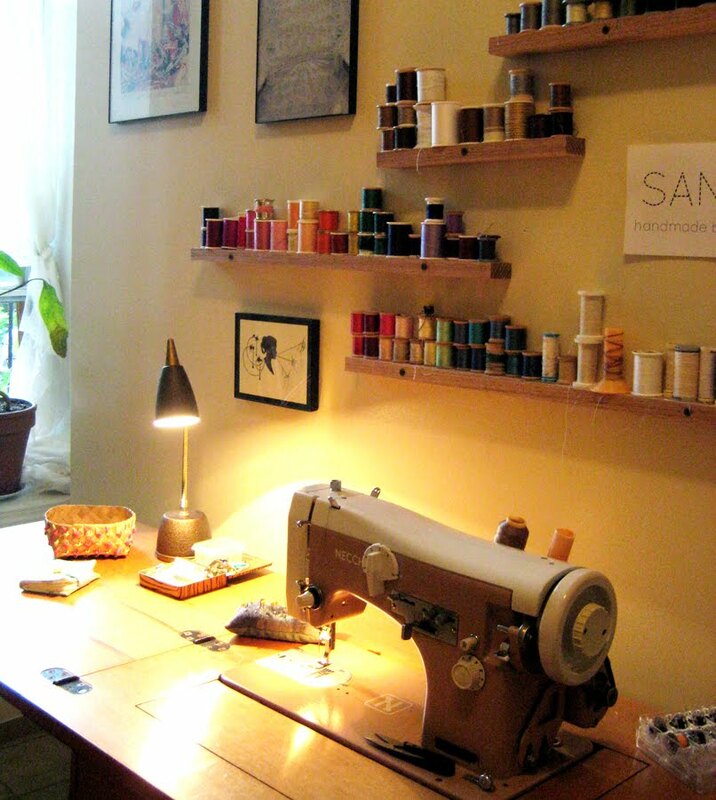 i didn't have a grand scheme or design in mind - my studio has evolved around my vintage sewing machine and the efficient use of space." "I love having my supplies and tools within easy reach and find that i am most creative and work the best in a clean, cozy environment. it's simple, it's efficient and it's just right. the colorful spools of vintage thread make me smile ." It's easy to see how beautiful things can be created in such a beautiful space. 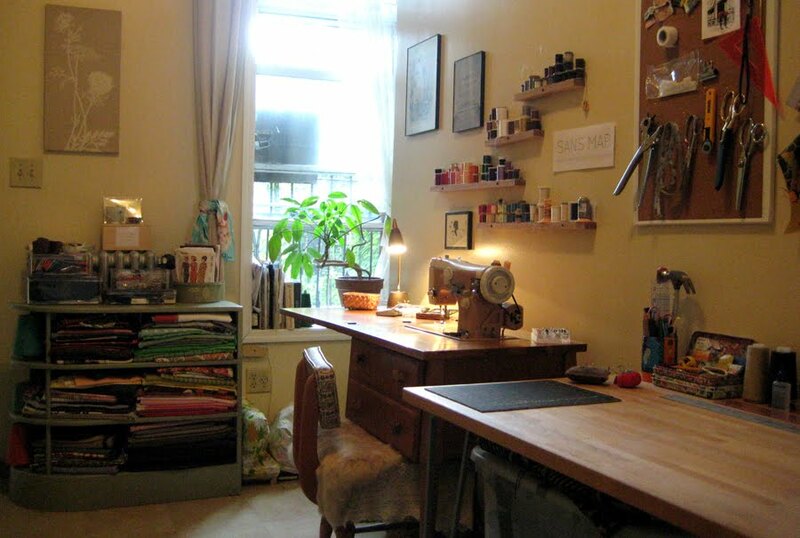 Visit Corey's Etsy Shop to see some of the creations that were made in this setting. So great to see Coreys creative workspace (much tidier than mine!). I met Corey at Hester on Saturday, her work is BEAUTIFUL. Thanks for sharing a little peak inside her world. I just retweeted the info too. What a great workspace and beautiful work. 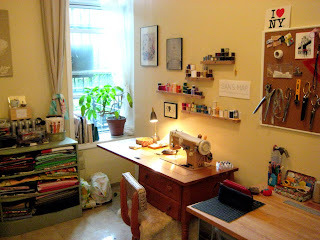 Inspiring - wonder how I can translate it to my 5x4 work area in my apartment in Hoboken. Neat! Literally, and her work is wonderful, too!